The western River Adur flows through the village. 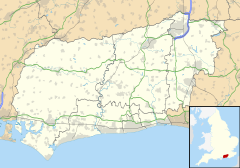 The village should not be confused with the much larger town of East Grinstead which lies 17.5 miles (28 km) to the north-east. The Shrine of Our Lady of Consolation dates from 1876 and is the Roman Catholic parish church. It is an important centre of Catholic pilgrimage in England. Two notable figures are buried in its grounds: Anglo-French writer and poet Hilaire Belloc (friend of fellow Catholic, G. K. Chesterton) and English writer Antonia White. St George's Church was first built circa 1100 AD and is the Anglican place of worship, and the Church of England parish church. Knepp Castle is located to the west of the village near the A24. It was a motte and bailey castle and first built in the 12th century by William de Braose. In 1214 the castle was refortified with the addition of a stone keep on top of the motte. Some remains of the keep still stand. The modern Knepp Castle nearby is a castellated mansion by John Nash. The Downs Link long distance path runs through the parish and can be used for walking or cycling. Wikimedia Commons has media related to West Grinstead. ^ "Knepp Castle". Pastscape. Retrieved 2011-06-15.